If you have access to quince, consider yourself lucky! I'm so happy for you...and I hope you will pick some. It's an amazing fruit, a widely known staple used in many places around the world, but nearly forgotten during the past century or so here in the United States. Raw, it's practically inedible, (though I've read stories of brave people eating them raw). Cooked, however (like in this simple jam) bitter tough flesh of quince transforms into gorgeous rose-colored sweetness. It is one of my favorite fruits to make jam with, because of its extremely high pectin content. It requires no extra boxed pectin at all. Quince trees are a part of my childhood. Grandma made quince jam, but you know what? I don't have clear memories of her making it, and I don't remember eating it. I certainly don't have her recipe, though I will be on the lookout for it from my family members. Get this; my brother has a jar of quince jam that grandma herself canned years ago, that he's been keeping as a sort of keepsake. It was one of the many canned goods left behind when Grandma died, most of which were dumped out as the house was cleaned up and emptied. Though the jam my brother saved may well still be good, we would never eat it--it would be like eating a relic. Now that I make quince jam myself, I feel like it has filled in a link to my childhood memories, and to Grandma herself. When I take a bite, the flavor awakens some long-forgotten moments in time. If I close my eyes, I can imagine that I probably sat with grandma at her table countless times, with quince jam sitting among the food spread, an unnoticed gem among various home-cooked dishes. I don't know if this recipe tastes just like grandma's, since I'm not sure if she added an extra spices or flavorings, but its simplicity (just sugar and water and quince) makes me think it is probably pretty close to how she did it. 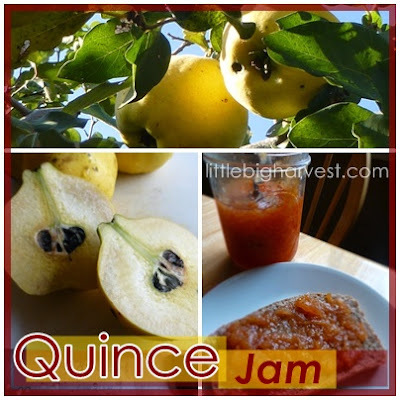 Go find and pick some quince (or purchase some..I'm hearing that some farmer's markets and even grocery stores are starting to carry them), and make some of this simple jam. The flavor--floral and sweet, which I liken to a mix of pineapple and pear, with a rose scent--will have you eating it right from the spoon! After quick rinse, grate the quince, working around the pits and seeds. Cooked with just water, sugar and lemon; easy and quick jam! 1. To prepare quince: Rinse the fruit, but leave the peel on. You can either cut the quince into halves or quarters and use a box grater to grate the flesh, working around the pits and seeds, OR you can quarter and core the fruits and give them a few pulses in the food processor (using the metal blade). Each way will give you a slightly different texture, but both textures are wonderful. 2. Bring the water to a boil in a large heavy-bottomed sauce pan, and then add the quince and lemon juice and zest. Lower the heat and simmer for 10 minutes, or until the quince is softened. 3. Pour in the sugar, stir, and bring the mixture to a boil again. Lower the heat to medium/high and let the jam cook for 30 minutes or up to an hour, depending on the consistency you want. Longer cooking time will give you thicker jam. The jam will turn from yellow to a deep apricot color. 4. 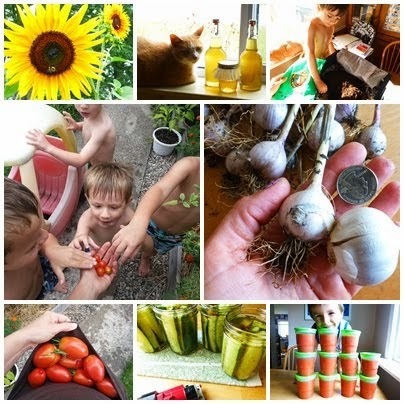 If canning, pour the jam into sterilized jars and process in a hot water bath for 10 minutes. You should get about 5 half-pints. History tells us that Thomas Jefferson grew quince on his estate, among his famous gardens. I wonder if quince jam ever graced his table?